Has anybody ever told you “They don’t build homes like they used to?” Well they are right… today they build them better! … Well most of the time. Construction standards have changed a lot in the last 20 years, especially in Northern Colorado where in the last 10 years we’ve had 3 building code updates. That is a lot, especially with Colorado Springs still building to the same code standards as 2009. Today I got to spend four and half hours with Todd Gamboa who is “THE” expert on construction quality. 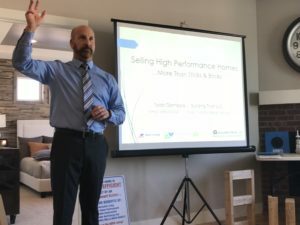 Hartford Homes (my new favorite builder) brought him in to teach a very fortunate group of Realtors about the value of “High Performance Homes.” This guy doesn’t just talk about code, he writes the code! One of the first things Todd wants you to know is that when a house is built to code, “code” means it is built to the minimal acceptable locally enforced standards. Anybody want to invest $300,000+ in something that just barely meets a minimum standard? No? Me neither. Since code has changed so much here in recent years, he’s a BIG fan of new construction, especially new construction built by folks like Hartford Homes. But what is the cost of that older home? 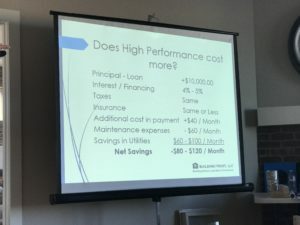 I’m not talking about price per square foot (a system we all like to use to value the price of a home) – I’m talking about what is the cost to run/maintain that home? Thin, “Low R value” insulation. Non efficient appliances. Faucets and toilets that use gallons upon gallons of water. Drafty exterior walls. Outdated building practices that open up your home to moisture and (I hate to say it) mold! This is the potential “price” of an older home. I don’t want to scare you off that 1960’s charmer, but everybody I’ve helped by a house knows that between me and the home inspector – we talk a lot about these things. New homes are getting so expensive though, and the neighborhoods are so cookie cutter and not as charming. Not always so! 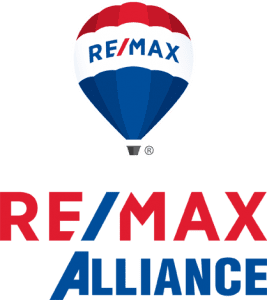 Yes a new home will usually cost more than old to buy, but as Todd put it today “Think about putting your hard earned money towards paying down your mortgage than paying your rising utility bills! What about the charm of a neighborhood? Yes, it will take a while for the trees to grow, but so many newer neighborhoods are designed around trail systems, parks, community gardens and have fun pools! 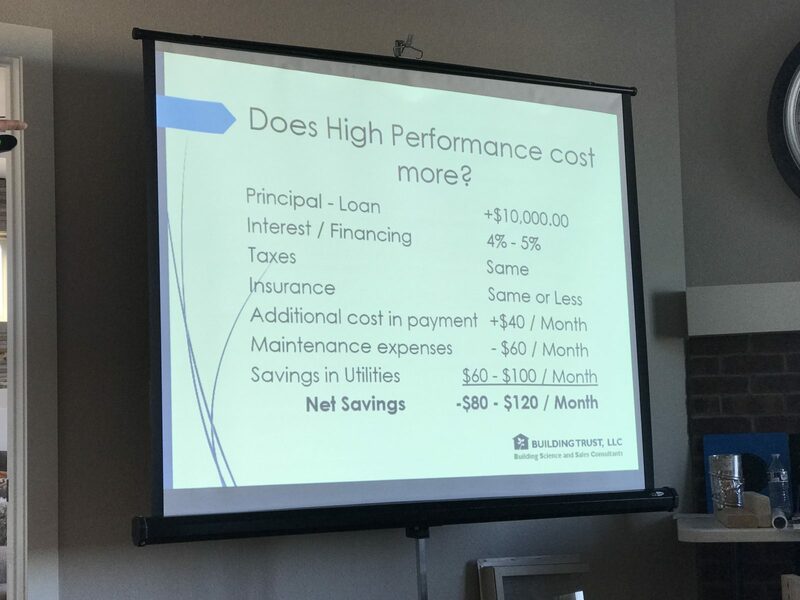 Eighty dollars a month is the equivalent of about another $10,000+ in purchase price and with the cost of utilities rising, are you ready to put some $$$$ into your Old Town / Mid Town charmer, or is it time to purchase a High Performing Home? I’ve always prided myself on understanding how a home functions. I’ve logged hundreds of hours with home inspectors. 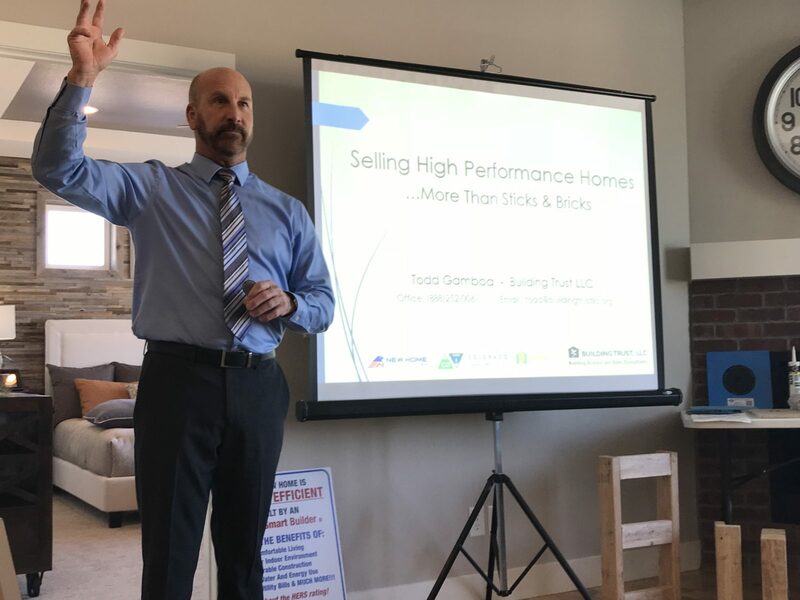 Followed builders around for 6 years on different stages of walk throughs on new construction homes, but today’s class with Todd was eye opening. It taught us not just what to look for in a new home (HERS ratings, Water Sense fixtures, Energy Star.., yeah, yeah yeah … I know all that) but also the mistakes some of the less reputable builders or newer inexperienced trades people make! OMG – this just took my new home buying skills to a newer level. Todd taught us to look for areas of water intrusion in new construction, the #1 reason for litigation in new construction. Poor installation of weather proofing (Tyvex and other weather barriers). Misapplication of insulation. Poor ductwork location. What a HERS score really means. The list goes on. I helped 2 clients this month purchase new construction and I cannot wait to apply some of this new found knowledge to the construction walk throughs. Thanks Todd! Keep up the great work. For more information about Todd and Building Science, visit www.buildingtrustllc.org … to go look at new contraction (and yes that 1960’s charmer too) just drop me a call.